A guest on one of Bliss Travels‘ tours through France got the best surprise during her time with us in Paris! A toast to the happiest couple! 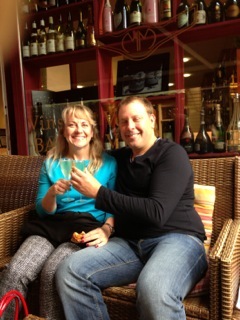 Janice contacted Bliss Travels a several months ago to come on our wine trip to Burgundy. She was interested in extending the trip –learning more about places to visit in France and about our various food and wine adventures. This was going to be her boyfriend, Jeff’s first time in France. Several months later when she arrived in Paris on a crisp autumn day, Janice, blonde, bubbly, and full of smiles despite the jetlag, was still bursting with excitement as she introduced her boyfriend, Jeff, to the City of Lights for the first time. The happy couple spent the next day exploring one of the most beautiful cities in the world—climbing the Eiffel Tower, strolling along the Seine, and even putting their own “love lock” on the Pont des Arts. But Jeff had more in mind than a sightseeing trip! The couple eats a gourmet picnic on our TGV ride to Burgundy. Check out that ring! He was a bit nervous –trying to find the “perfect” setting. Should he propose during dinner? Afterwards? At the hotel? Jeff had no idea how things were going to proceed (and neither did Janice). After a romantic candlelit dinner at Le Reminet and Jeff’s favorite, hot chocolate, they wandered back to the hotel. There he resolved that the privacy of their little boutique Parisian hotel was the best place to state his “question”. Once back in their room, Janice was astonished—and delighted—to find Jeff getting down on one knee. “I was so excited, I’m not sure I remembering hearing anything besides ‘Will you marry me?’ ” laughed Janice, recalling the happy evening. But she immediately said yes—bien sûr! 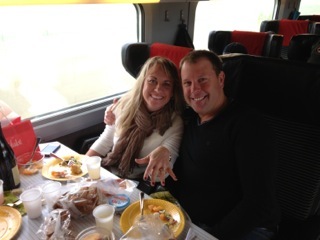 As our little group of 7 enjoyed a picnic on the TGV trip to Burgundy the next morning, Janice and Jeff couldn’t wait to share their wonderful surprise and her stunning ring. As she told us the story, everyone asked if Janice was surprised. Jeff’s response was “nobody was more surprised than I!” I guess when love strikes, there’s nothing much you can do but follow through! A private tasting at “closed to the public” Domaine de l’Arlot. The technical director himself conducted the tasting! Jeff and Janice, we couldn’t be happier to celebrate your good news with you! Wishing you years of “bliss”! Wine lovers–stay tuned for more tales from our trips to Bordeaux! This entry was posted in burgundy wines, celebrations, destination weddings, elope to paris, food, france, france travel, french wines, honeymoons, paris, pinot noir, Tour France, travel, travel services, vacations in france, wedding in paris, wine vacations, wines from burgundy and tagged burgundy, destination weddings, engagements, food, france, honeymoons, paris, travel, vacations in france, wine, wine trips.